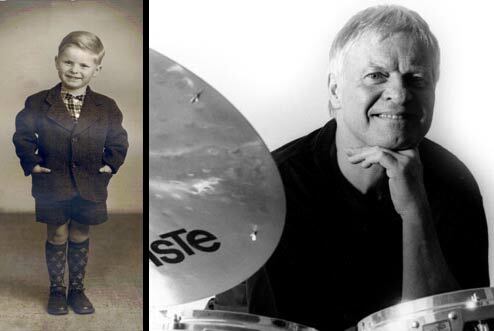 Alex Riel was born September 1940 in Copenhagen, Denmark, and has since the sixties remained firmly established as one of the most significant and influential jazz drummers in Europe. His career began in the mid-sixties when he was the house drummer at the legendary jazz club "Montmartre" in Copenhagen. With bassist Niels-Henning Ørsted Pedersen and pianist Tete Montoliu or Kenny Drew he accompanied musicians such as Ben Webster, Dexter Gordon, Kenny Dorham, Johnny Griffin, Don Byas, Donald Byrd, Brew Moore and Yusef Lateef. Over the years Alex Riel has played and recorded with an impressive number of fine jazz musicians representing both the traditional and the modern way. His very first impression of jazz drumming was that of Big Sid Catlett and Zutty Zingleton and this early influence is still perceptible in his playing. 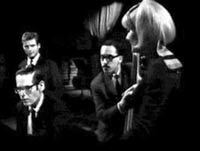 So is the influence of Danish drummer William Schiöpffe, who played a central role on the European jazz scene of the sixties. However Riel’s appearance with musicians such as Wayne Shorter, Freddie Hubbard, Jackie McLean, Archie Shepp, Dizzy Gillespie, Michel Petrucciani, Gary Burton, John Scofield and David Sanborn has made him widely known as an outstanding modern drummer taking up the styles of Elvin Jones, Roy Haynes and Tony Williams. In 1965 Alex Riel released his first recording as a leader. This year Riel also was chosen as the "Danish Jazz Musician of the Year". The award was presented to him by no other than Duke Ellington assisted by drummer Sam Woodyard. (video clips of this can be found on the internet). On a memorable night at the “Montmartre” Alex even had the great pleasure to play with Ellington’s “right hand”, pianist Billy Strayhorn. Also, footage of Riel playing with pianist Niels Lan Doky and bassist Gary Peacock on a tour in 1989 is available on video as “The Close Encounter Recording Session". Trumpeter Palle Mikkelborg and Alex Riel formed in 1967 the ”Riel-Mikkelborg Quintet”. This group won first prize at The Montreux Jazz Festival (Switzerland) in 1970 and later that year they performed at The Newport Jazz Festival (USA). 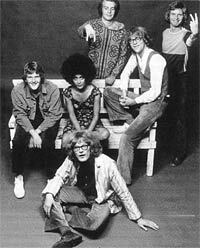 They also co-led the jazz fusion group “V8” in the early 1970’s. As his discography shows Alex Riel has also been working quite a lot outside the jazz area. In the late 1960s he was a founding member of the legendary Danish rock group "Savage Rose," with whom he toured extensively in Europe and USA. In 1969 the band performed at the original “Newport Festival” in US, sharing the stage with James Brown, Jethro Tull and Sly & the Family Stone. The original members of Savage Rose were: Anisette (voc), Anders Koppel (org), Thomas Koppel (pia), Flemming Ostermann (el.gui), Jens Rugsted (el.bs) and Alex Riel (dr). Alex Riel stayed with Savage Rose for five years - plus he rejoined the band temporarily in the 90s. During this time he recorded several albums with them, including the album “Triumph of Death” with music written for the Royal Danish Ballet. one of the most significant Danish rock groups ever. Therefore their debut album was recently selected to be part of the Danish national “Cultural Canon”. In addition to this, Alex Riel has drawn attention to himself as a rock drummer through his long time work with Danish singer and composer “Sebastian”. He was part of Sebastian’s so-called “super group” that recorded several hit albums during the 70s and 80s and toured a great deal. Ever since the late 50’s Alex Riel has played as a sideman on several hundred jazz recordings with names such as Stan Getz, Chet Baker, Ben Webster, Kenny Dorham, Dexter Gordon etc (Please see the extensive “Recordings as a sideman” in the discography section of this site). own name as well. These recordings are featuring contemporary stars such as Jerry Bergonzi, Michael Brecker, Kenny Werner and Mike Stern. However, his CD "DSB Kino" from 1998 is featuring the 82-year old trumpet legend Harry “Sweets” Edison, one of Alex's all time favourites. And on “Unriel” Alex is, once again, joined by legendary bass player Eddie Gomez. The powerful live recording "The Riel Deal" from 1996 recieved a Danish Grammy for “Best Jazz Recording of the Year”, and a few years ago Alex introduced his very own trio on the cd “What Happened?” which recieved 6 stars reviews and topped the list in Japan for best sellling international record. In the year 1999 - on the 90 years Birthday of sax legend Ben Webster with whom Alex played so much in the sixties – Alex received the honourable “Ben Webster Award” along with bass player Niels-Henning Ørsted Pedersen and the talented young pianist Olivier Antunes. When Alex turned sixty in 2000 he was celebrated during a whole week at the Copenhagen Jazzhouse where he appeared in different constellations with Palle Mikkelborg, Marilyn Mazur, Kenny Werner, the NDR big band and many more. The cd “Celebration” is a trio recording of one of these birthday concerts with pianist Kenny Werner and bass player Jesper Lundgaard. The following year Alex received another award, the "Django d'Or 2001" in the category “Master of Jazz”. In the recent years Alex Riel has been touring a great deal with the Hamburg based NDR big band featuring Southafrican pianist and composer Abdullah Ibrahim (Dollar Brand) and Etta Cameron. He has also been busy recording and touring with different groups led by artists such as sax player George Robert, bassist Mads Vinding, pianist Jan Lundgren, bassist Peter Vuust, pianist Ketil Bjørnstad, sax player Benjamin Koppel and many more. Furthermore Alex has been touring with his own “Alex Riel Trio”, and played various studio jobs and concerts with names such as: Phil Woods, Charlie Mariano, Lisa Nilsson, Stefano Bollani, Palle Danielsson, John Taylor, Johnny Griffin, Jacky Terrasson, Andy Sheppard, Didier Lockwood, Palle Mikkelborg, Pat Metheny a.o. 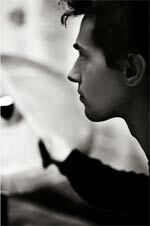 For several years Alex Riel played in various piano trios led by Danish bass ace Mads Vinding. 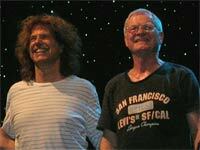 One of those trios featured pianist Carsten Dahl; a constellation that turned out to be a huge success (their cd “Six hands, three minds, one heart” won several Danish Grammys). Carsten Dahl has since then established himself as one of the absolute greatest piano player Denmark has ever produced, and he is being recognized as such on the international jazz scene. Now this powerful trio constellation has re-united; and with even greater success it could seem. What characterizes the Dahl / Vinding / Riel trio is a unique interplay with room for serious conversation as much as pure musical fun – all delivered with an obvious virtuosity by all three involved who also seem to radiate a sheer joy of playing together. This is undoubtedbly one of the best European jazz trios around! There’s another re-union that Alex Riel is truly enjoying being a part of: SANTA CRUZ, the leading Danish fusion band of the 80s are back together! The band members - who in the meantime all have been leading their own groups and had great carreers in pop, rock and jazz - are all getting a kick out of playing the powerful, melodic jazz-rock fusion of the 80s again. And judging by all the positive feed-back from audiences and critics, the “old” tunes do still have that special appeal that made them so popular back then. One of the band’s concerts in Copenhagen Jazzhouse was recorded and can be heard on the cd “Cruzing” (Cowbell Music). Stefan Pasborg is already a very well-known name on the Danish jazz scene where he’s long been praised for his great skills as a drummer and his original musical ideas and approach. With a musical upbringing that was highly influenced by his god father, Stefan is as familiar with classic jazz drumming as he is with avantgarde and rock. And so, representing two generations of modern drumming, Riel and Pasborg have chosen to pay tribute to some of the Greats from earlier generations: Gene Krupa, Big Sid Catlett and Zutty Singleton, who’s way of playing never cease to amaze and inspire. Part of a long drum duet with the two of them are included on Stefan’s release “Tripple point”. Besides, a recording of a recent performance in Copenhagen Jazzhouse is planned to be released in some format. In 2004 Alex formed his own trio with Danish bass legend Jesper Lundgaard and one of the new stars of the Scandinavian jazz scene, the young pianist Heine Hansen. The trio’s debut CD “What Happened?” was released in October 2004 on “Cowbell Music” and as described above it received excellent reviews, and only a few weeks after it’s release it topped the list for best selling international jazz record in Japan. The trio’s second CD “The High And The Mighty” was released in May 2007 on Cowbell Music.